The IGFA, Wild Oceans, Coastal Conservation Association of California, and American Sportfishing Association have been working together in California to promote the transition from drift gillnets to more selective fishing methods for swordfish. Drift gillnets are an outdated commercial fishing method in which half the catch is discarded as bycatch of unwanted or protected species. An alternative fishing method, that’s been thoroughly tested for the last five years, is deep-set buoy gear that allows commercial fishermen to more specifically target swordfish. Not only does this alternative gear result in much less bycatch and bycatch mortality, but it also allows swordfish to be caught and iced down more quickly, which results in a better quality product that fetches a higher market price. California is the only state that allows the use of this harmful fishing gear. Senator Ben Allen introduced Senate Bill 1017 in February in an effort to phase out drift gillnets by compensating drift gillnet permit holders for retiring their nets and, at the same time, providing a transition to a more sustainable commercial fishing gear specifically designed for targeting swordfish. 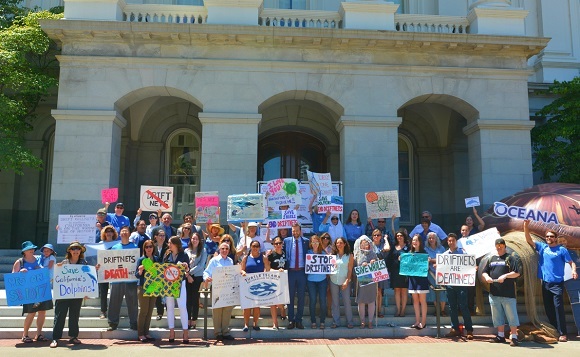 On Tuesday, May 29, 2018 the California recreational fishing community rallied on the north steps of the state Capitol to support this important piece of legislation. With the overwhelming support of the recreational fishing community, the Senate passed the bill with a vote of 33-0. This is truly a big step for recreational anglers and California’s marine resources. The IGFA and its coalition partners will continue working to help ensure that this bill is next passed in the House and ultimately signed into law.